Here are the species and locations of common species in and around the Calgary area. The information is from A Birdfinding Guide to the Calgary Region (published in 1993 and revised in 2007). For recent sightings, try searching for a particular species on Albertabird. Greater White-fronted Goose – Most likely near Brooks. Cattleland Slough (north of Strathmore) in the spring is a reliable spot. In fall, also try Eagle and Namaka lakes. Snow Goose – As previous species, but higher numbers pass through the Region. In fall, greatest concentration occurs at McGregor Lake and to the east. Ross’s Goose – Occasionally occurs on major water bodies east of Calgary and on the Bow River. Trumpeter Swan – Migrates in small groups, generally west of Calgary. In spring try the pond at the junction of the Trans-Canada Highway and Jumping Pound Road (take the exit 22.7 km west of Canada Olympic Park; a good view of the pond can then be obtained from the on ramp), and the ponds at the junction of the Trans-Canada Highway and Sibbald Creek Trail. As well, in the spring a very reliable spot is the large slough along Tp. Rd. 252 west of the Jumpingpound Gas Plant. Regular on migration on Glenmore Reservoir and in good numbers on Frank Lake. Wood Duck – There is a resident population at Inglewood Bird Sanctuary and they can be found occasionally throughout the Region. Eurasian Wigeon – Reported in small but increasing numbers throughout the Region. Cinnamon Teal – Fairly reliable on shallow water bodies east of Calgary. Greater Scaup – Occurs in small numbers on larger water bodies but identification requires care. In Calgary in fall, it is worthwhile trying Glenmore Reservoir and the Bow River (Inglewood, Bow River). Harlequin Duck – Breeds on the upper Highwood, Elbow and Sheep Rivers, and the Bow River in Banff National Park. Overwinters in very small numbers along the Bow River in Calgary, especially at the Inglewood Bird Sanctuary and near the Glenmore Trail Bridge. Surf Scoter – Regular in small numbers. In spring on mountain lakes; in fall on Glenmore Reservoir, Eagle Lake and at Seebe Pond. Black Scoter – Occasional fall records from Glenmore Reservoir, Eagle Lake and Barrier Lake. Long-tailed Duck – Regular in very small numbers in fall, especially on Glenmore Reservoir; also on the Bow River, e.g. Carseland Weir. Barrow’s Goldeneye – Breeds on mountain lakes. Most easily found in winter along the Bow River in Calgary, especially at Carburn Park. Hooded Merganser – Most easily seen on migration at the Inglewood Bird Sanctuary and in winter on the Bow River near the Glenmore Trail Bridge. In the fall Ovans’ slough is a very good spot for this species and they are also found in the large slough north of Highway 1A along Grand Valley Road. Occurs more generally on the Bow River in winter. Red-breasted Merganser – During spring migration most often seen at Bruce Lake and the Irricana sloughs. In spring and fall also on the Bow River in Calgary (Inglewood, Bow River) and Glenmore Reservoir. Can also be found on Clear Lake east of Stavely. White-tailed Ptarmigan – Frustratingly elusive. In early summer try around the tops of the Lake Louise and Sunshine Meadows (0-5) gondolas; Bow Summit (can also be seen from the highway in winter) and Parker Ridge on the Icefields Parkway in Banff National Park; and Ptarmigan Cirque in the Highwood Pass. Your chances of finding them increase after the first snows in fall when their tracks may be followed. Dusky Grouse – Widespread but scarce in the higher foothills and mountains. Easiest to find at the Sheep River Sanctuary. Wild Turkey – Introduced in the Porcupine Hills south of the Region; may be spreading. Has been seen as far north as the Sheep River valley. More reliable at Cypress Hills Provincial Park, southeast of Medicine Hat. The farm along highway 22 south of Chain Lakes has been very good the last year or so for this species. Red-throated Loon – Observed irregularly in fall on large water bodies such as Glenmore Reservoir and Eagle Lake. Pacific Loon – Observed infrequently (almost annually) in fall on large water bodies such as Glenmore Reservoir, Eagle Lake and Namaka Lake. Other recent locations include Bruce Lake and the Bow River in Calgary. Clark’s Grebe – Accidental in the Region but should be looked for carefully. Nearest breeding population is outside the Region at Crow Indian Lake, southeast of Lethbridge. Has often been reported from Frank Lake the last few years. American White Pelican – Nests at Lake Newell and several other locations in the Brooks area. Foraging flocks usually occur on major rivers and lakes southeast of Calgary, especially at Carseland Weir and now regularly occur on the Bow River and at Glenmore Reservoir in Calgary. American Bittern – Elusive, more often heard than seen. Try the north end of Bruce Lake and the north side of Namaka Lake. Great, Snowy and Cattle Egrets – Accidental but ranges are expanding. Great Egret seen more frequently. Black-crowned Night-Heron – Lakes and ponds with cattails, also irrigation ditches; especially the Brooks area and Namaka Lake. White-faced Ibis – Regularly sighted at Pakowki Lake in southeast Alberta since 1974. Breeds in northern Montana. Regular in the Calgary Region. The best locale is at Frank Lake where they breed. Check also at Pakowki Lake and the south end of Namaka Lake. Sighted as well at other places. Turkey Vulture – Seen regularly in the Red Deer River valley, especially at Dry Island Buffalo Jump Provincial Park and in the Drumheller area. The South Saskatchewan River Valley in Medicine Hat is very good for this species. Occasionally seen in Calgary area. Osprey – May be found along the Bow River in and west of Calgary. Nests at the first Vermilion Lake in Banff National Park. Nests in Calgary on artificial nesting poles provided along the Bow and Elbow Rivers. Bald Eagle – A strong spring migration occurs through the foothills west of Calgary (Grand Valley, Forestry Trunk Road, Sheep River). Winters along the Bow River in Calgary. Ferruginous Hawk – Nests sparsely east of Calgary. Most likely at Dinosaur Provincial Park and along the Trans-Canada Highway east of Brooks. Becomes more numerous outside the Region in the general area northeast of Brooks. Golden Eagle – Widespread but elusive. Most easily found during spring migration through the foothills with Bald Eagles (Grand Valley, Sheep River, Highwood Valley), and especially in the Kananaskis. Gyrfalcon – Annual winter visitor reported with increasing frequency in the Calgary area (due perhaps to the abundance of overwintering ducks). In recent years has been reported mostly east and south of Calgary. Try along the Bow River and the Forest Lawn stormwater retention pond if ducks are present. Peregrine Falcon – Birds from breeding programs have nested on tall buildings in downtown Calgary since the early 1980s. Has nested regularly since 1995 on Craigie Hall at the University of Calgary campus. Yellow Rail – Heard along Horse Creek Road approximately 9 km north of Hwy 1A. Also in the wet meadow near the Bighill Creek culvert on S.R. 567. Good locations vary from year to year depending on water body levels. Some good Spring Locations close to Calgary in recent years have been: Railway Slough near Irricana; Langdon Slough near the junction of the Trans-Canada Highway and Hwy 9; Sadler’s Slough; and Dawson Lake (10 km north of Strathmore on S.R. 817) but viewing is poor from the highway and somewhat dangerous – there are usually better spots such as the slough a km or two south of Dawson Lake. Fall Locations are: Langdon Reservoir; Johnson’s Island; the east end of Namaka Lake; and the south end of Eagle Lake. Piping Plover – Scarce in the Region. Possible at Hand Hills and Little Fish lakes (east of Drumheller). Although not in the Calgary region, Reflex Lakes north of Provost is a reliable locale for this species. Black-necked Stilt – Has bred just east of Shepard along Twp Rd 232, probably at the sloughs along Hwy 1 just west of the junction with Hwy 9, and possibly at other locations near Calgary. Further east, at Kininvie Marsh and other locations near Brooks, it is easily found in summer. Upland Sandpiper – Becoming very hard to find in the Region. Possible wherever there is unplowed native grassland that has not been overgrazed. The area around Langdon (Dalemead) Reservoir turns this species up from time to time. The area just south of Eagle Lake has been good for this the past couple years. Red Phalarope – The only location in the Region where it has been recorded at all regularly is Namaka Lake in late fall. Ovans’ Slough turned up one of these in the fall of 2006. During migration large numbers of gulls congregate at certain locations where it is possible to study them at close range. Inglewood Bird Sanctuary is the most outstanding. Other good locations are: Frank Lake, the southeast corner of Namaka Lake; Carseland Weir; Carburn Park; and Lac Des Arcs. Forster’s Tern – In spring and summer present at Eagle, Namaka and Bruce lakes and in the Brooks area. Readily identified in September when fall-plumaged birds (together with Common Terns) feed at the southern end of Eagle Lake and Carseland Weir). Snowy Owl – Can be found during most winters anywhere east of Calgary by slowly driving the side roads. Some of the most reliable areas near the city are: Shepard, Indus, Langdon, and around the airport. 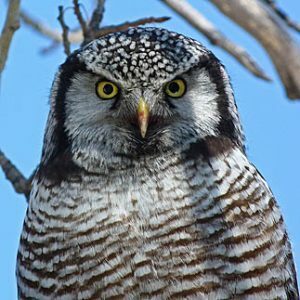 Northern Hawk Owl – Irruptive. Most likely to be seen in winter along edges of mixed forest in the foothills; try along the Grand Valley Road to Water Valley area. The Boggy Lake area north west of Water Valley has had a breeding pair the past two summers (2005-2006). Northern Pygmy-Owl – Widely distributed in the foothills but numbers fluctuate from year to year. This species is often reported along Highway 68 in the Sibbald Flats area and also in the Water Valley area, particularly around Winchell Lake. Burrowing Owl – Has nested in pastureland east of Calgary; local in the Brooks area. Numbers have seriously declined recently – your best chance may be outside the Region in eastern Alberta. Barred Owl – Elusive in heavy, mixed woodland. May be found at the western end of Sibbald Creek Trail, or in Brown Lowery. Great Gray Owl – Most sightings have been in the Water Valley area but can occur throughout the foothills. Somewhat irruptive. The Grand Valley Road often turns up this species, particularly in early June, but anytime in the spring and winter. Boreal Owl – Calls after dark on calm nights in March and April along the Sibbald Creek Trail). Northern Saw-whet Owl – Very widely distributed in the foothills. Can be heard calling on calm nights in April, most reliably along the Sibbald Creek Trail, in the Water Valley area and at Brown Lowery Recreation Area. Common Nighthawk – Declining. Along river valleys, especially at Dinosaur Provincial Park. In Calgary try Inglewood. Black Swift – Nests in Johnston Canyon in Banff National Park. Ruby-throated Hummingbird – Regularly nests on the valley bottom in the Weaselhead Natural Area in Calgary; can also be found at the Alberta Special Crops and Horticultural Research Centre in Brooks. Calliope Hummingbird – Most easily found until early July at moist locations in mountain valleys where males are on territory. Has been regular at Bow Valley Provincial Park and Strawberry Campground marsh (Highwood Valley). Try also at feeders in Exshaw, and Highwood House. Regular breeder in the Weaselhead bottomlands. Rufous Hummingbird – Widespread in the foothills. Good locations are: along the bluff in the north Weaselhead Natural Area; along the Many Springs Trail in Bow Valley Provincial Park; and along the Highwood Trail (S.R. 541) east of Highwood Junction. Red-naped Sapsucker – Can be found in the foothills southwest of Calgary, particularly in the Sheep and Highwood valleys. American Three-toed Woodpecker – Widespread but elusive in coniferous woodlands in the foothills. Try Brown Lowery Recreation Area or the Water Valley area. In Calgary has been found in Edworthy Park, and at the western end of Fish Creek Provincial Park. In Banff try the Fenland Trail. Black-backed Woodpecker – Extremely hard to find in the Region. Found in similar habitat to the previous species but prefers recently burned areas. Brown Lowery is the most likely location. Alder Flycatcher – Sibbald Creek Road. Willow Flycatcher – Much less widespread in the Region than Alder Flycatcher. Try the beaver pond on the Flowing Waters Trail in Bow Valley Provincial Park, and along Hwy 40 north of Highwood Junction. Also Sibbald Creek Road. A good site for this species is in Sibbald Flats, particularly west of Powderface Trail along highway 68. Hammond’s Flycatcher – Most easily found at the Muleshoe Picnic Area in Banff National Park. Dusky Flycatcher – Can be found locally throughout the foothills. Try at deciduous stands along the Highwood Trail (S.R. 541) east of Highwood Junction, and the Many Springs Trail in Bow Valley Provincial Park. The Western Flycatcher Complex – The split, based on the vocalizations of males, of the Western Flycatcher into Cordilleran and Pacific-slope Flycatchers is difficult to apply in the Region. Found in steep-sided river valleys in the foothills. Try William J. Bagnall Wilderness Park (formerly Silver Creek), and the Sheep and Highwood rivers. Also Sibbald Creek Road (at the Jumpingpound gorge). Say’s Phoebe – Most easily found during the nesting season in the Drumheller and Dinosaur Provincial Park badlands. Western Kingbird – Widely distributed east and south of Calgary; most easily found in the Brooks area. Loggerhead Shrike – Seldom seen away from short-grass prairie. Provincial stronghold is east of Dinosaur Provincial Park. Blue-headed Vireo – Seen at Brown Lowery and north in the foothills up to the Water Valley area. Cassins Vireo – Seen (and heard) mostly in the Highwood Valley and south. There seems to be some overlap between the Blue-headed & Cassins, especially on migration, when either may turn up anywhere. Philadelphia Vireo – In the early I980s singing males occurred in the foothills west of Water Valley. Most likely to be encountered as a fall migrant, e.g. at the Inglewood Bird Sanctuary. Purple Martin – Regular in Chestermere. Violet-green Swallow – Found along the Bow River at Seebe and Banff. On the prairies try Dinosaur Provincial Park..
Rock Wren – Try badlands in the Drumheller area and in Dinosaur Provincial Park. Also breeds in the foothills, for example in the Sheep River valley and in the quarry on Nose Hill. Winter Wren – Local in the mountains. Try Johnston Canyon and the Bourgeau Lake Trail in Banff National Park, and King Creek Canyon in the Kananaskis Valley. American Dipper – Try below the dam at Seebe, Johnston Canyon in Banff National Park, and Elbow Falls (on Hwy 66 west of Bragg Creek). In winter, try along the Kananaskis River, along the Highwood River near Highwood House and on the Elbow River below Glenmore Dam. Varied Thrush – In summer found in older, damp, coniferous forests close to the Continental Divide. During migration more widespread. Sprague’s Pipit – Found in moderately grazed grassland east of the foothills. From mid-May to late July, most often located by distinctive aerial song. Group A: Those which nest throughout the Region. This group consists of Yellow Warbler and Common Yellowthroat. Group B: Those which nest only in the foothills and mountain portion of the Region but are found throughout on migration. This group consists of Tennessee, Orange-crowned, Yellow-romped, Townsend’s, American Redstart, Ovenbird, Northern Waterthrush, MacGillivray’s, and Wilson’s. Townsend’s Warbler – Uncommon summer resident of damp stands of tall spruce and fir in the mountains. Typically forages in tree tops – best located by its wheezy song. Try Johnston Canyon, Fenland Trail and Lake Louise in Banff National Park. Small numbers pass through Calgary (Inglewood Bird Sanctuary, Lawrey Gardens) in fall migration. Chestnut-sided Warbler – Has been found singing on territory near the beaver pond on the Flowing Waters Trail in Bow Valley Provincial Park and at the western end of Winchell Lake; an adult feeding one young was observed in the Weaselhead in 1992. 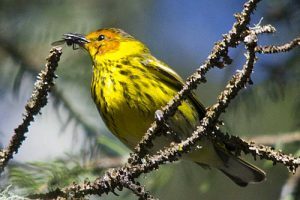 Cape May Warbler – Was found singing on territory at Brown Lowery Recreation Area in four summers in the early 1980s. Recently have become more common in migration in Calgary area. 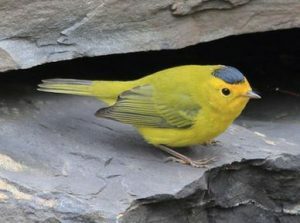 Connecticut Warbler – Territorial males have been reported from the Water Valley area since the mid-1980s. The Perenoud Wildlife Reserve, south of Grand Valley Road, along Rge. Rd. 54 has had this species on mating territory the last several years. Another reliable locale has been along Tp. Rd. 291 west of Grand Valley Road. Yellow-breasted Chat – Nests at Dinosaur Provincial Park and in Police Point Park in Medicine Hat. Spotted Towhee – Most easily found at locations in the Red Deer River valley such as Dinosaur Provincial Park, the Drumheller area, and Dry Island Buffalo Jump Provincial Park. Brewer’s Sparrow – The prairie subspecies (breweri) occurs in Dinosaur Provincial Park, while the alpine subspecies (taverneri) breeds above timberline. Possible locations for the latter are: Sunshine Meadows and the Highwood Pass. Lark Sparrow – Restricted in the Region to the Red Deer River valley area, particularly Dinosaur Provincial Park. Lark Bunting – In some years can be seen from the Trans-Canada Highway between Brooks and Medicine Hat. More commonly found southeast of the Region. Baird’s Sparrow – Some recent locations include: near the Irricana sloughs, Bruce Lake, Namaka Lake, and west of Little Fish Lake. Numbers vary considerably from year to year. To find this species learn its distinctive song. Nelson’s Sharp-tailed Sparrow – This species’ normal range is north of the Region but it has been found in a marsh complex near Big Hill Springs Provincial Park since the late 1980s. They are slightly more numerous in the Calgary region now. Sibbald Creek Road, Horse Creek Road, Priddis Slough and immediately east of Spruce Meadows have all held them in recent years. Lately a reliable site for this species has been the wetlands along Horsecreek Road about a kilometer south of Tp. Rd. 272. Fox Sparrow – Good locations are: the Highwood Pass and Sunshine Meadows. Breeds along Sibbald Creek Road, Sheep River Road and quite widely in the foothills. Along the Bow River in Exshaw will often turn up this species as will the willows along highway 68 west of Powderface Trail. Also widespread on migration. Swamp Sparrow – Extremely local breeder west of the Forestry Trunk Road (S.R. 940), north of Hwy 1A. Small numbers pass through Calgary in fall migration – try areas of riverine shrubbery. Also breeds along Sibbald Creek Road, and possibly at other places south of Hwy 1A. This species can occasionally be found in the wetlands below the Forestry Demonstration Interpretive Centre along Highway 68. Golden-crowned Sparrow – Found in shrubby areas at timberline. An accessible and reliable location in Banff National Park is Parker Ridge, on the Icefields Parkway near the Jasper Park boundary. It has also been reported from the Bow Summit area, Sunshine Meadows and the Lake Louise area. McCown’s Longspur – Prefers dry short-grass prairie. The most accessible location is east of Tilley, south of the Trans-Canada Highway. In dry driving conditions try the east side of Wolf Lake and the southeast side of Lake Newell. Chestnut-collared Longspur – The common breeding longspur of the eastern half of the Region. Usually prefers denser, taller, short- grass prairie than McCown’s. Good locations include the east and south sides of Lake Newell, the Tilley area, and the eastern side of McGregor Lake. Lazuli Bunting – Breeds on aspen-covered slopes in the foothills southwest of Calgary, particularly in the Highwood and Sheep valleys. Gray-crowned Rosy Finch – In summer found in small groups on rocky slopes above tree line. Sunshine Meadows is a likely location. Gathers into large flocks in fall, when they become more widespread at lower elevations. Regular winter occurance at a feeder in Exshaw. Purple Finch – Found in mixed woodland in the foothills. In Calgary try the western end of Fish Creek Provincial Park and the Weaselhead. House Finch – In recent years, numbers in the Calgary area have markedly increased. It nests in the city and remains year-round.